Discussion in 'Growing Marijuana Outdoors' started by Marie-jane, Mar 31, 2006. I've used this technique once before with great success and many of my friends has used it also. It offers great protection against deers and rabbits. And its a personnal greenhouse which keep you from having to water them frequently during seedling stage. I like it, but I am only an amatuer to growing. My only problem with it is I think it would bring more attention to my plants. Definatly, mine are ground level. I put the in large pots, take a post hole digger, dig out a hole the size of the pot, put soil over it, so you can't see it. Looks natural, and is very easy to move if your plot is comprimised. This is for straight in the ground and I dont get how it would get more attention of people because its only for this first 4 weeks. They are still small, cops and rippers aren't looking for your plants at that time of the year. Also you spot should be were no one would think of going in the first place. Good idea, but it IS an eye sore.It also doesn't give the little plant any air movement, you'd have to come to it everyday to open the top for air exchange or mold will grow. Even exchanging the air once a day, the stems will be weak from no wind to strengthen them. And when you f9inally take the top off, you must ween them off of it. They get used to the high humidity and they aren't too strong just yet, so they wither a BIT. I have the same technique for cloning, But indoors of course. (humidity dome) It should be around soon for everyone to view. THC101 - there are air holes in the bottle. he shows it several times. 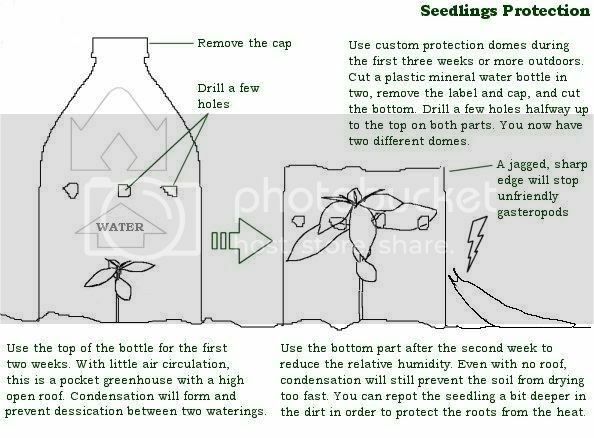 i think with a good amount of holes, the plant could develop a good stem to support itself when the bottle was taken off. Well I guess this calls for an experiment when I start growing which wont be until Mid-End of May I will do some plants without these humidity domes. I've never had mold problems last time I used it and my friends either. The air hole are made big enouf for wind to get rid of the excess humidity. Didn't see that untill now. I think it should be fine other then being an eye sore and weak stems..
And no, the holes won't be enough. There needs to be enough wind to make the little girl dance . i do that but i cut the bottom off the pot to let the roots out the bottom. brown tip on my leaf?